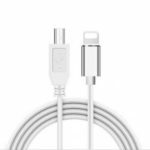 The DM APD009 Aiplay cable is a 32GB storage solution that requires no battery no operate; it plugs directly into your iOS device, allowing you to offload, add, or back up files while simultaneously charging and syncing it to your computer via the USB connector. Featuring fingerprint and digital encryption, it securely stores your data. 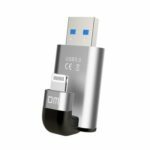 8-pin to USB 3.0 connectors provide a 3-in-1 charge & sync flash drive solution. USB 3.0 features quick transfer of music, videos, pictures and more. Charges your iOS devices with ultra-fast speed. 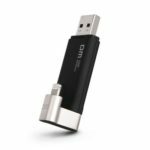 Built-in 32GB flash drive, features fingerprint and digital encryption, automatically and securely sync and back up your data, files and more. Compatible with iOS 7.0 and above & Mac OS & Windows. 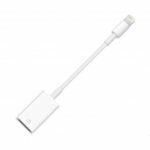 Compatible with iPhone 7/7 Plus/6s/6s Plus/5/5s/5c/5SE, iPad Air/2, iPad Mini/2/3, iPad with Retina display, iPad(4th gen), iPod touch(5th generation). Plug the cable into your cell phone, then download the APP by following the instruction. 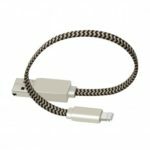 Lightning to USB Type-B 2.0 Adapter OTG Cable for Musical Instruments Compatible with iOS10 iOS11 1.